How happy am I that No Added Sugar have finally extended their range to take in sizes up to 12 years? I worked with them when they began producing their slogan T's back in 2000 and though we haven't worked together for a number of years I have continued my love affair with their clothes. I've had so many of their dresses for my girls over the years and they have been worn and washed so many times - yet they still look as good as new. My first buy from their new collection will be the Scrabble dress. 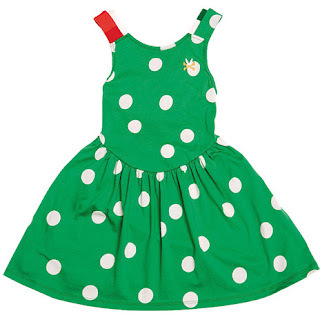 Made from their high quality premium cotton jersey (that doesn't shrink), in a beautiful green spot (that co-ordinates with the stuff that my girls are still loving from last summer). It has a lovely criss cross back in contrasting red and it will be loved by my girls! Now available in sizes from 3 to 12 years (yippee). Scrabble dress £45. Oh and they have the best delivery service too. If you order before 3.30pm you get your goodies the next day - and you really do! Thats very nice! Bagsy the hand me down!